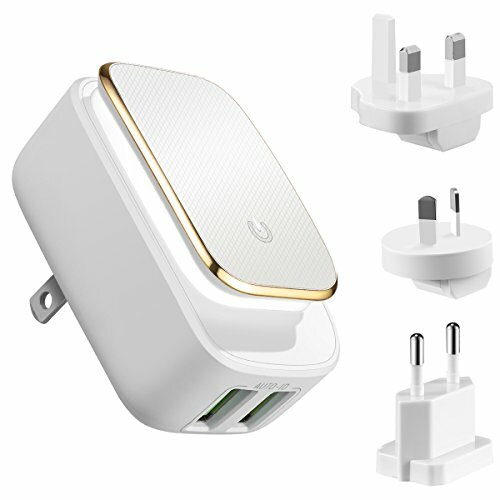 4 Different Plus Options: With US/UK/AU/EU plugs, great for using at home, in the office or when traveling. Dual USB Ports: Charging 2 devices simultaneously and rapidly. Save more time. LED Night Light: Great for using in the dark places, such as bedroom, bathroom, living room, children's room or other places. Touch Power Switch: Only 1 switch can be used to control ON/OFF/BRIGHTNESS. Safe & Reliable: Built-in protection system and manufactured from fireproof PC material, quality assurance. Compact & Portable: Takes little space, fits in pocket, bag or suitcase. Delicate Outlook: Pure white color with gold edges, simple but sleek. Wide Compatibility: Compatible with Smart-phones, Digital Cameras,Tablet PC, E-book Readers, Bluetooth Speaker, and more. 1.Click the touch switch, the light is ON. Click it again, the light is OFF. 2.After turning on the light, you can long press the touch switch to adjust brightness.